Heat the oven to 200°C/180°C fan/gas 6. Put the cherries in the gratin dish/es, sprinkle over the sugar, then drizzle with the butter. Roast for 15 minutes until just tender. Meanwhile, for the sabayon, put the egg yolks, sugar, wine and orange zest into a large heatproof bowl and rest it over a pan of just-simmering water, making sure the bowl doesn’t touch the water. Whisk vigorously (by hand or with an electric hand mixer) for about 8 minutes until thick and foamy and almost tripled in volume. 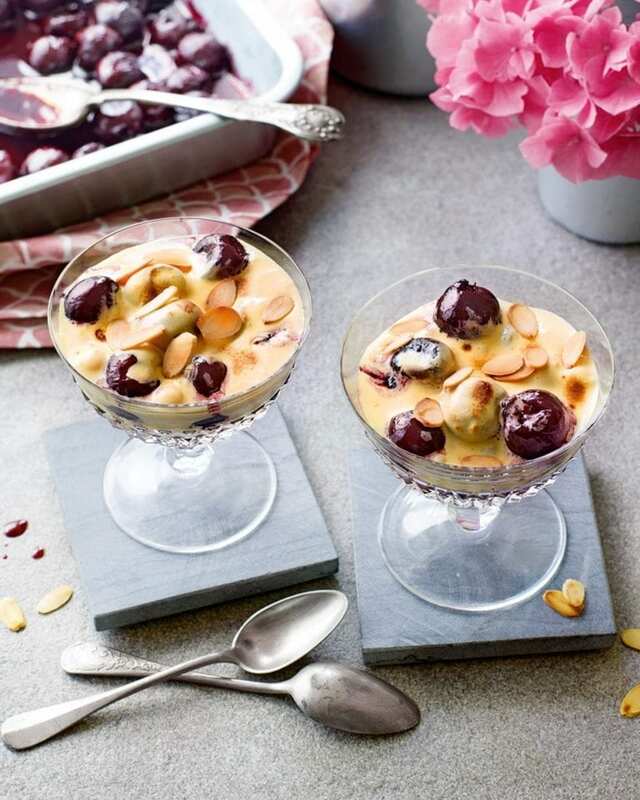 Spoon the sabayon over the hot roasted cherries, then scorch the surface here and there using a cook’s blowtorch, if you wish. Scatter with the almonds and serve.